This series is something I've been thinking about for a while, ever since I wrote the Exploring Ethnic Cuisine, over at Food Bloggers of Canada. I finally got around to it after one of my readers commented on my post on homemade chaat masala where I agonised over what a spice was, only to find it sitting in my spice cupboard under a different name. So I thought it may be time to do a series on all the spices I use for my everyday cooking, and perhaps introduce you to new ones as we go along. Along with My Masala Dabba, I will also do a Herb Collection, but to be honest, that will probably be quite a shorter series. I am not aiming to be Wikipedia here - I just want to share my knowledge of the spices I use and how I use them, along with pictures. This is not a comprehensive dictionary of spices or their use. And sometimes I may well be wrong in what I write, so please don't hesitate to jump in and correct me or add your own thoughts to the post. Tell me what you know, and what I've missed and I will add it to each post. 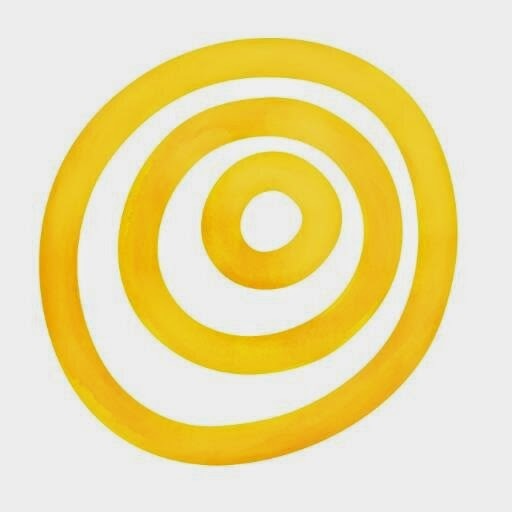 I welcome all criticism and feedback and its what makes me and this site better. Cardamom is one of my favourite spices. I like it so much, that the top notes of the perfume that I normally wear are cardamom. Cardamom comes in two varieties, green and black. The little green pods are smaller, while the black pods are larger and pack a stronger, even harsher, punch of flavour. 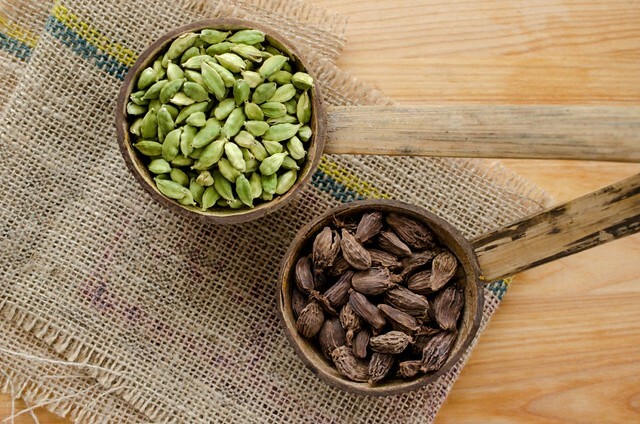 Green and black cardamom vary wildly in their flavours. Green cardamom is mild with sweet/ spicy notes and a light, almost eucalyptus-like floral bouquet. Black, on the other hand is has a strong, almost verging on the harsh, flavour, and a very unsubtle, but highly distinctive, smoky flavour. Cardamom is grown in the tropical areas around the Indian Ocean, with Kerala and Karnataka in India producing the hardiest varieties. Sri Lanka has also been growing cardamom, and its becoming a popular spice that is exported all over the world. That said, I believe its Guatemala that produces most of the cardamom used all over the world with India and Sri Lanka coming a close second . There are several varieties of green cardamom, and I usually use the Mysore variety if I manage to source them from India. Otherwise, I use whatever my ethnic grocer provides, as sadly, there is no way to guarantee provenance of this spice. Both green and black cardamom are used in very different ways in several cuisines around the world, and in characteristic ways of Indian cooking. Below, I detail how to use them, along with a few recipe suggestions. Cardamom is a spice that is used in both sweet and savoury cooking, and adds flavour that enhances the fragrance and taste of the dish. I normally use green cardamom pods in my everyday cooking, and if I just say cardamom pods in my recipes, its usually a reference to the green pods. I also use black cardamom, and its more often to add the hint of smoke that is characteristic of some Indian dishes. 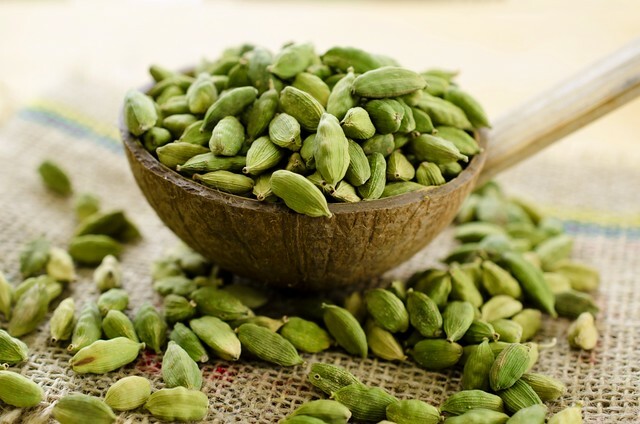 Green cardamom can be used in three ways - whole, lightly crushed with the pod, and seeds only. Cardamom powder, or ground cardamom can be quite expensive, so its worth buying whole green pods and crushing the seeds in small quantities to make your own. Green cardamom, along with cloves and cassia bark, is an essential part of what we call 'whole spice garam masala' and is usually used whole to infuse flavour into dishes. I normally just leave whole spice garam masala in my dishes, because I don't mind the extra flavour they impart, but if you are fussy about whole spices, you can always tie them up in a small muslin bag, aka bouquet garni, and then remove the bag just before serving. Black cardamom is rarely used as a whole spice in Indian food, the only notable difference being in authentic Kashmiri style rogan josh (for an excellent recipe, check out Thoughts From Ajoy here). But the seeds are almost always used in a classic garam masala, and its what imparts the slightly smoky flavour to the spice mix. I use both green and black cardamom in my garam masala, but in case of the black pods, I only use the seeds and discard the pod. 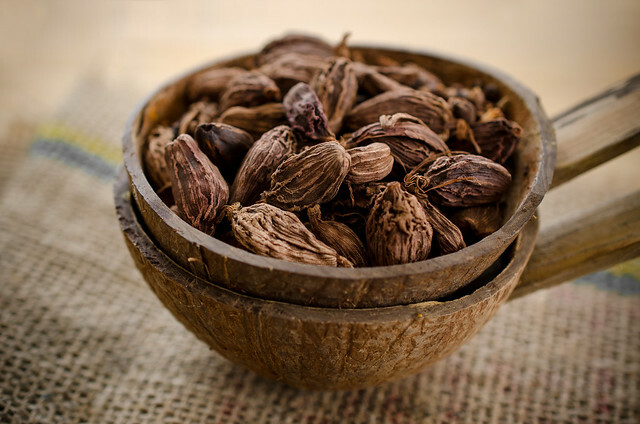 Black cardamom can be quite overpowering, but used carefully and in small quantities adds warm flavour to dishes. Green cardamom is also a staple in Middle Eastern, Thai Massaman and Mediterranean cuisines, though I recently found out that Finnish and some Scandinavian countries also use cardamom. My recent favourite has been cardamom flavoured coffee, and of course, its a staple in Indian chai. I also like it in most of my desserts, my favourite being my mum's gulab jamun, but also in most Indian sweets. Here are a few recipes in which I use cardamom as a major flavouring. I am also currently working on a classic Indian dessert that uses cardamom, and will add the link once I post the recipe. Until then, enjoy the delicious fragrance of cardamom, and also, to leave you with an interesting nugget that I found... did you know that cardamom is the world's third most valuable spice, only superseded by saffron and vanilla! Now that is indeed food for erm... spice for thought. Garam masala spice blend, in which I use bothe black and green cardamom pods. Biriyani masala, that uses either green or black pods. And my favourite Dal Bukhara and for a titch of rice, in my Sweet Pulao Rice. Carrot Halwa with Saffron and Cardamom Infused Cream, the cardamom adds a subtle delicacy to the cream that cuts through the richness of the halwa. Excellent idea for a series of posts and you hit the head of the nail on this one, for me, anyway. I have wanted to have an authentic answer to the difference of these two cardamoms for a very long time. THANK YOU! From the read, am I to understand that when I buy ground cardamom I am buying ground green cardamom? I have all of the above in my cupboard - one of my fetishes... but no idea how to get the seeds out of the pods. How? They are so small. It is not easy. Do you have relatives in Southern India yet, who can provide you with a cardamom that has been grown by someone they know so you can get the one you want and know the provenance of your spice? Just curious, as this is what I do when going back to the former Yugoslavia each summer for the Eastern Block Paprika. I go to the guy who grows it and has the small "factory" that produces it. It is the best! Love Love Love this series idea! What a great idea Michelle! This is going to be a spice bible of sorts :-). I too love the scent of cardamom. I often powder the seeds with some sugar and store the powder in a jar in the fridge for use in desserts. Any tips for opening the pods would be great. I recently discovered that squeezing them pops them open which was a real Duh! moment for me. You may have some other tricks up your sleeve. Look forward to th rest of the series. Michelle, came here from foodgawker and I'm loving it here..
Cardamom is one of my favorite spices too. We use it in everyday tea as well as in simple and in exotic desserts and flavored rices..
Hello Michelle, This is my first time on your space and I must say that you have stunning post. This post about cardamom is so informative. This is one of my favourite spices. I always have a big stock of cardamom in my pantry. I am looking forward for the rest of your series.